Leigh G. Dillard and I are engaged in the planning stages of a reader on eighteenth-century book illustration that would encompass various traditions (English, French, German, Spanish, etc.). In order to best position the reader, we would be most grateful if those of you who work on book illustration (and perhaps also teach courses on the subject) could provide some feedback on our preliminary ideas. You could write to us directly (cionescu@mta.ca and Leigh.Dillard@ung.edu) and we will compile a report for the SHARP list. 1) Would you use such a reader in a course? What type of course would you consider using it in? Would your library be interested in purchasing it? 2) Do you have any suggestions about its contents? Any specific texts that you believe should be included? Any translations of seminal texts that we should commission? This panel seeks papers related to second-generation Romantic-era British writers and/or their literary circles, so proposals addressing the works of John Keats, Percy and Mary Shelley, Lord Byron, Leigh Hunt, and William Hazlitt will receive priority. Proposals that engage with the conference theme (“In Concert: Literature and the Other Arts”) are especially welcome. Subjects to be considered might include (but are not limited to) Romantic literature in relation to music, concerts, songs, painting, engravings, caricatures, drawings, panoramas, book arts, calligraphy, dance, theatre, opera, architecture, sculpture, china, pottery, ceramics, textiles, and, in later contexts, electronic art, film, and photography. Please send a 250-word abstract, bio or CV (one page only), and audio-visual requests to Ben P. Robertson, Troy University, (bprobertson@troy.edu) by 15 May 2015. 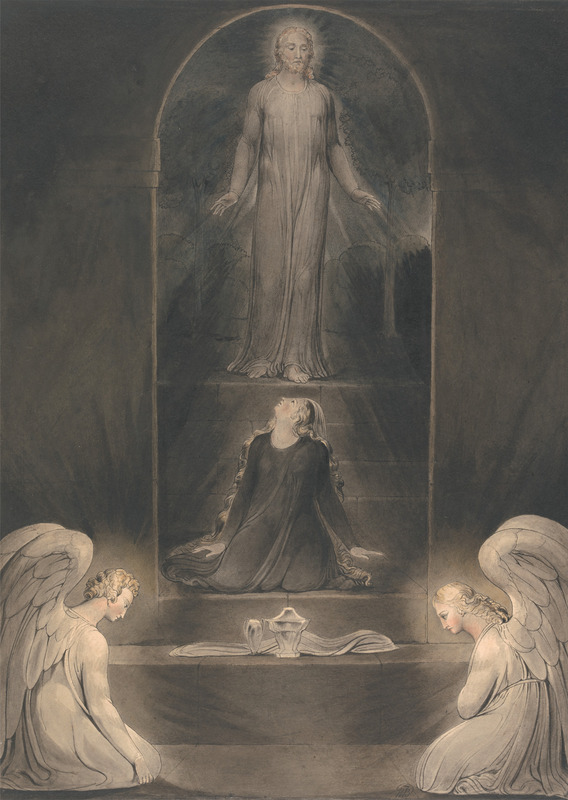 Image of the Month: William Blake, ‘Mary Magdalen at the Sepulchre’ (c.1805). William Blake, ‘Mary Magdalen at the Sepulchre’ (c.1805). Watercolor with pen and ink on paper. 17 1/4 x 12 1/4 inches (43.8 x 31.1 cm). Yale Center for British Art, Paul Mellon Collection. February’s ‘Image of the Month’ comes from Naomi Billingsley, PhD Candidate in Religions and Theology, University of Manchester, and recipient of a Bibliographical Society Studentship to assist with attendance at the third RIN symposium, ‘Literary Galleries’. This is one of approximately eighty watercolour illustrations to the Bible produced by William Blake for his loyal patron Thomas Butts (a civil servant) between 1800 and about 1805 (several designs were added after this date but the majority were completed in this five-year period). It is not clear how these designs originally functioned as illustrations: they may have extra-illustrated a large Bible or they might have been kept in their own portfolio or volume as a Bible in pictures. The design is from c.1805 and depicts Mary Magdalene at the tomb (or sepulchre) of Jesus; it is probably an illustration to John 20, because in the Gospels of Matthew, Mark and Luke, there are others with Mary when she goes to the tomb, and it is John that mentions Mary seeing ‘two angels in white sitting, the one at the head, and the other at the feet, where the body of Jesus had lain’, which Blake has included in the design (v. 12). However, Blake has compressed several moments in the narrative together in a single frame: in John’s account Mary stays ‘without’ the tomb and stoops to look inside (v. 11); she then turns around and sees Jesus but mistakes him for a gardener (v. 14). Although Blake has placed Mary on the threshold of the tomb, she is at the bottom of a flight of steps leading down to it, and so she is not stooping; Jesus stands at the top of the steps above her. Blake has probably chosen this arrangement for compositional reasons: the design’s symmetry is characteristic of Blake’s ‘gothic’ style in this period. Indeed, this watercolour is one of six similarly symmetrical and near-monochrome designs of the death and resurrection of Christ which seem to form a sub-group within the series of biblical watercolours (The Crucifixion and the following designs – not including #499 or #503 – viewable via the Blake Archive). Blake’s use of composition may also make a theological point. Jesus and Mary are directly aligned in the central vertical portion of the design; their arm gestures are almost identical and there is eye contact between them (see the Blake Archive’s image enlargement). This may be an expression of Blake’s idea that every person is an embodiment of Jesus – as articulated, for example, in his statement to Henry Crabb Robinson that Jesus ‘Is the only God… And so am I and so are you’ and his aphorism ‘The Eternal Body of Man is The Imagination. that is God himself | ישע Jesus | The Divine Body | we are his Members’. So we might read Mary Magdalene here as a member of Jesus’ Divine Body, making the design not only ‘mere’ illustration but also a vehicle for Blake’s own ideas. Any readers in the New Haven (Connecticut, USA) area will be able to see this work in the exhibition ‘The Critique of Reason: Romantic Art, 1760-1860’ between 6 March and 26 July at the Yale University Art Gallery this year. Cf. Martin Butlin, The Paintings and Drawings of William Blake (New Haven: Yale University Press, 1981): nos. 433-526. David Bindman, Blake as an Artist (Oxford: Phaidon, 1977): 144. William Blake to Henry Crabb Robinson, December 1825, in G. E. Bentley, Jr. Blake Records (New Haven: Yale University Press, 2nd Ed. 2004): 421. William Blake, ‘The Laocoön’, in David V. Erdman (ed. ), The Complete Poetry and Prose of William Blake (New York: Doubleday, 1988): 273 and available via the Blake Archive. This exhibition will focus on the printed propaganda that either reviled or glorified Napoleon Bonaparte, on both sides of the English Channel. It explores how his formidable career coincided with the peak of political satire as an art form. 2015 marks the 200th anniversary of the Battle of Waterloo – the final undoing of brilliant French general and emperor Napoleon Bonaparte (1769–1821). The exhibition will include works by British and French satirists who were inspired by political and military tensions to exploit a new visual language combining caricature and traditional satire with the vigorous narrative introduced by Hogarth earlier in the century. 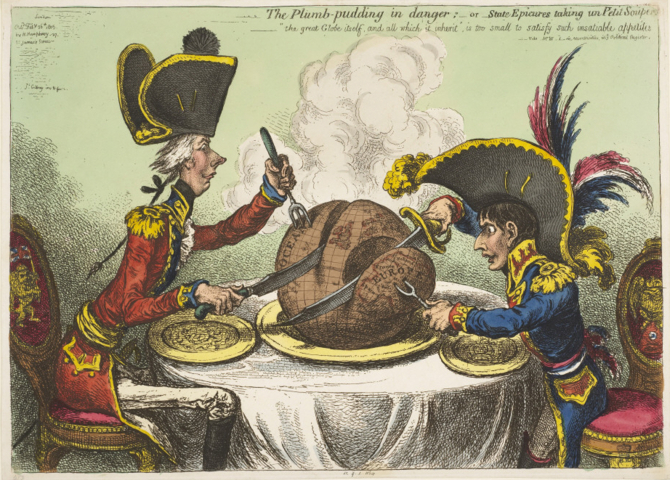 This exhibition includes work by James Gillray, Thomas Rowlandson, Richard Newton and George Cruikshank. Download a list of exhibition-related events at the British Museum here. Joanna Marschner (Historic Royal Palaces), Moira Goff (The Garrick Club), Alex Werner (Museum of London). The seminar will take place in the Clore Learning Centre at Kensington Palace at 5.15 p.m. and will be followed by a drinks reception. As usual the seminar is free and open to all, but as numbers are limited at the venue, you need to reserve a place by emailing Gillian Williamson (gswilliamson@virginmedia.com). Download a map of Kensington Palace access. Convenors: Prof Markman Ellis, English (m.ellis@qmul.ac.uk); Prof Colin Jones, History (c.d.h.jones@qmul.ac.uk); Prof Miles Ogborn, Geography (m.j.ogborn@qmul.ac.uk); Prof Amanda Vickery, History (a.vickery@qmul.ac.uk), Prof Barbara Taylor, English and History (b.g.taylor@qmul.ac.uk), Prof John Barrell, English (j.barrell@qmul.ac.uk). The deadline for submission of abstracts to the RIN panel at BARS 2015 approaches: February 15th. Of particular interest for RIN members is the RIN panel ‘Romantic Illustration’: see the panels page on the BARS 2015 website here. Nation and print: the British archipelago; cities of print; transatlantic and transnational exchanges; Romantic cosmopolitanism and print; translation; landscape and/in print; Wales and its Romantic contexts; national (especially Welsh) patterns of influence and exchange in the international context. Producing and consuming print: Romantic readerships; publishers; circu­lating print; legislation, copyright and print; technologies of print; plagiarism, forgery and piracy; popular and subaltern cultures of print; periodicals and journalism; gender and genre; print as new and old, ephemeral and collectable objects; print beyond reading (paper money, cards, etc. ); the fate of print as ‘rubbish’. Intertextual exchanges: politics and print (e.g. 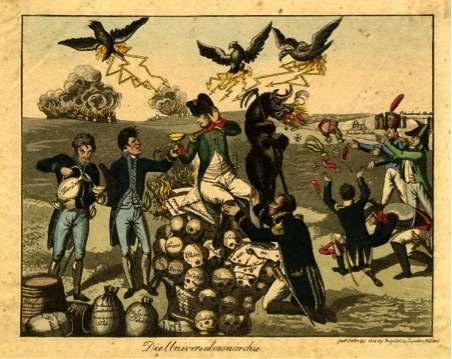 revolution and radicalism, war, Napoleon, Waterloo); satire and parody; science and print culture; performance and print; Romantic visual cultures (including art and illustration); representations of print and printing; fashion; adaptation and remediation; the Romantic essay; print and its others – epitaphs, manuscripts, marginalia, etc. ; print and imprint as Romantic metaphor or ideology; popular pastimes. Textual scholarship: editing texts; bibliography and book history; manuscripts, correspondence and diaries; analysis and quantification; digital humanities. Romantic legacies: physical traces and imprints; architecture; Romantic anti­quarianism; Victorian Romanticism; Romanticism and modernity; Romanticism and new media; Romantic biography; lives in print; Romantic afterlives; celebrity and print; adapting the Romantics (film, art, literature). Traditional 20-minute paper proposals (250-word abstracts), submitted individually. Poster presentations showcasing innovative projects or digital outputs (250-word abstracts), submitted individually. Proposals for open-call sessions (350-word descriptions of potential session, outlining its importance and relevance to the conference theme). Accepted open-call sessions will be advertised on the BARS 2015 conference website from mid-January 2015. Please note: the deadline for submission of open-call panels has now expired. Proposals for themed panels of three 20-minute or four 15-minute papers (250-word abstracts for each paper with speakers’ details and an outline of the panel’s rationale from the proposer). Extended deadline for submission of abstracts: 15 February 2015. Submissions can comprise proposals for individual papers, poster presentations and submissions to open-call panels (which will be published online from mid-January 2015). If you are applying to an open-call session, you should include the name of the session on your proposal. All proposals should include your name, academic affiliation (if any), preferred email address and a biography of 100 words. Please send proposals and direct enquiries to the BARS 2015 conference organisers, Anthony Mandal and Jane Moore (Cardiff University) at BARS2015@cardiff.ac.uk. For the latest updates about the conference, follow us on Twitter @2015BARS and join our Facebook group at https://www.facebook.com/groups/BARS2015/. Under Napoleon’s Empire we find London acting as a hub for printing caricatures of Napoleon in a range of languages, and with a number of distinctive styles. The above print, Die Universalmonarchie, for example, claims to have been published by Boydell & Co. in London in 1815, but the Boydells were based at Cheapside, not – as the print states – at Pall Mall (once the location of the late Josiah Boydell’s famous Shakespeare Gallery). The publication information would seem to be spurious and the British Museum suggests that it was likely published in Paris. Is this print, then, German, French, or even possibly English? Who exactly is its market? How far is its imagery tailored to a particular “national” audience and in what ways might it be distinctively comprehensible to such an audience? Besides London, what other European hubs were important, at what moments and why? ‘Visual Print Culture in Europe 1500-1850’ aims to draw together scholars with a range of disciplinary skills to discuss the methods, representational forms, and distribution of and audience for visual print media in Europe between 1500 and 1850. Its seeks to de-nationalize the study of visual print culture, and to explore the extent to which interactions between engravers and printers, artists and consumers in Europe, and a range of common representational practices produced a genuinely European visual print culture – with local modulations, but nonetheless with a common core. Papers can draw on a range of disciplinary backgrounds in exploring the exchange of techniques and processes, the analysis of imagery, and the identification of markets, and in analysing the conditions under which particular generic forms crossed or failed to cross national boundaries. Although the emphasis is on European visual print culture, the impact of that culture on, and its interaction with, the wider world is also of interest. The Conference will be held at the University of Warwick’s Palazzo and conference centre in Venice, December 5-6, 2015. Proposals for papers should be submitted to t.smith.2@warwick.ac.uk by June 1st 2015 but please feel free to contact Mark Philp in advance with any queries. The conference may be able to provide some financial assistance to those whose home institutions are unable to support their attendance, especially postgraduate students.